The handmade lokta paper wrap on each bundle of incense is traditional and appealing. Authentic cloth prayer flags printed on hand-carved woodblocks are specially made for dZi by The Gu-Chu-Sum (9-10-3) Movement of Tibet, established in 1991 and based in Dharamsala, India. Gu-Chu-Sum was first organized by ex-political prisoners from the Tibetan freedom movement; monks, nuns and lay people who had escaped from Tibet due to political persecution. 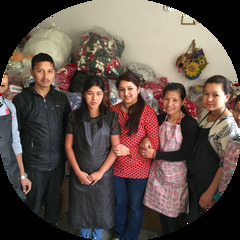 Its purpose is to provide employment and support to Tibetan refugees needing help in India, and to educate about human rights abuses in Tibet.